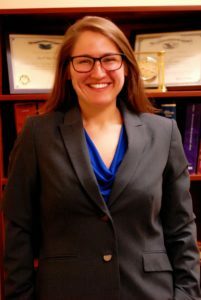 Mary Kramer joined Moore Ingram Johnson & Steele in 2018 as a member of the firm’s Litigation Department with a focus primarily in the area of Workers’ Compensation. Mary attended Widener University Commonwealth Law School. During that tenure, Mary was president of the Public Interest Law Society and awarded the Outstanding Service Award in recognition of her commitment to helping others. Prior to law school, Mary completed her undergraduate degree at New York’s Hunter College, where she majored in sociology. A strong social justice advocate, Mary worked with the Fortune Society in New York, assisting former convicts reenter society, which is what inspired her to attend law school. She also worked as Interim Director for Family Promise in its Gloucester County network, assisting homeless families with children achieve housing stability. Mary currently lives in Harrisburg. In her spare time, Mary enjoys boxing and watching basketball and hockey – specifically the Celtics and Penguins, respectively – and has a fondness for DC comics.